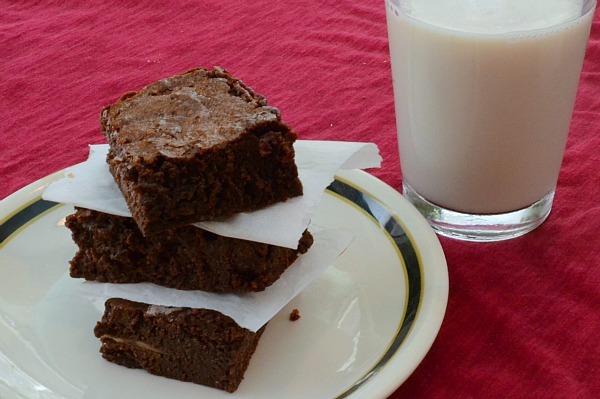 Looking for a great Brownie recipe? 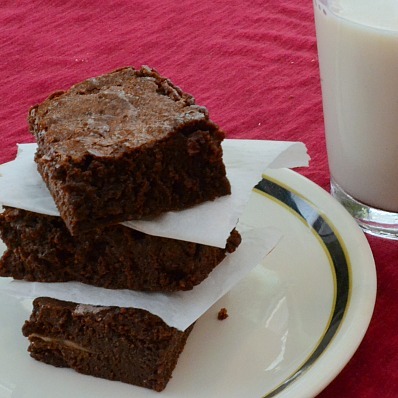 I have been wanting to make these brownies for a very long time. 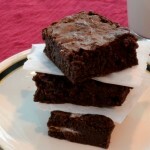 However, I understand how dangerous a big plate of brownies can be in my house–and I didn’t want to put myself in danger. But, the other day, I needed to bake something and I just so happened to have almost all of the ingredients. Well, almost. I had everything to half the recipe and make a smaller pan of brownies. I can handle a half pan of brownies. If you have willpower, you should go ahead and make the full pan. These come from the Baked Restaurant in NYC, and the recipe was modified a bit from the original. I used the Brown Eyed Bakers adaptation of the recipe and had to modify it slightly to make half a batch.
) Preheat over to 350 degrees. Prepare an 8x8 baking pan with parchment paper, leaving some overhang for ease of removal.
) Mix together flour, cocoa, and salt. Set aside.
) Using a double boiler, melt chocolate, butter and coffee powder together. Keep your eye on this and once melted, allow it to cool.
) Once cooled to room temperature, whisk the eggs in. The mixture will be pretty thick.
) Stir in the vanilla.
) Sprinkle the flour mixture over the top and then fold everything together. Do not over mix. Don't use a mixer here---a spatula should be just fine.
) Pour into baking pan and bake for about 25-30 minutes.
) Let cool a bit in the pan and then remove from the pan using the parchment paper handles.